With many koi keepers now covering their ponds during the winter months our Winter Koi Pond Covers are increasingly in demand. 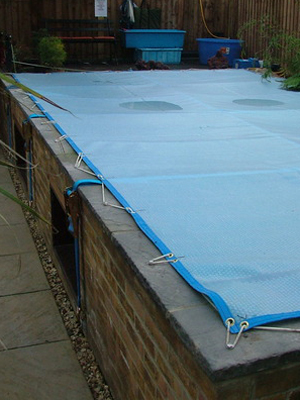 We can supply you with the perfect Winter Koi Pond Cover tailored to your pond. Our Solar weave Winter Koi Pond Covers are manufactured using 400 micron bubble cover with added strength from an integral translucent woven top layer which not only allows Uv light to pass through the Pond Cover it is also incredibly strong. Winter Koi Pond Covers are tailor made with a reinforced edge and a choice of fixing systems; this can be fixed securely to the pond surround whether it is brickwork, concrete, wood or earth. With simple shaped Winter Koi Pond Covers easily manufactured we can also cater for any shape imaginable with a template to work from. When the Koi Pond Cover is not in use it can be simply folded away and easily stored. For the most cost effective Koi Pond Cover keep the shape as simple as possible, ideally square or rectangular. For more difficult shapes it may be necessary to use a polythene sheet as a template. During the winter months insulate your koi pond and maintain a higher water temperature by fitting a tailored cover, even if your pond is not heated. We can supply you with a 400-micron heat retention cover, now with a transparent woven top sheet for added strength. The Winter Koi Pond Cover is manufactured to fit your pond and will allow a minimum of 85% UV penetration. Each Winter Koi Pond Cover has a reinforced edge and is available with draining holes, a choice of secure fixing systems and support straps if necessary. The area between the Winter Koi Pond Cover and the water`s surface will retain heat in the same way as a greenhouse. Any shape of pond can be covered. It will reduce your heating costs! Support straps to reduce sag are available and will help to keep the cover off the surface of the water. The support Straps are 5 m in length and come with an expanding anchorage for installing into a wall on each end. In order to reduce your heating costs or simply to insulate your pond please contact us enquiries@absolute-koi.com for a quotation on a Winter Koi Pond Cover.